My debate last week with Gordon Chang on China's future at the Vancouver Resource Investment Conference was a stimulating, intellectual exercise. A healthy market needs a compromise between the bid and ask, and a discussion between people who strongly disagree is a great way to promote critical thinking. Critical thinking is vital to our investment process as a means to ensure that we question assumptions. One way our portfolio management team practices a critical-thinking process is through a weekly S.W.O.T. (Strengths-Weaknesses-Opportunities-Threats) analysis of key factors influencing global markets. By hammering out the positives and negatives, we can paint an accurate picture of the realities we face. The S.W.O.T. model allows us to avoid pitfalls by weighing the evidence. Lack of critical thinking sometimes leads to bubbles, such as the one taking place in the parabolic rise in the number of articles foretelling China will experience a "hard landing." Last fall, more than 1,000 articles questioned the possibility of a "China crash," according to data from BCA Research. This is twice as high as the number in 2004, when fear articles reached 500. Gordon's bearish pronouncements only added to the extreme negativity groupthink surrounding China's economy. Investment strategist Keith Fitz-Gerald, a long-time friend of mine, wrote an excellent article comparing today's doomsday sentiment of China to the naysayers who forecasted the demise of the U.S. during the market bottom of March 2009. Throughout the past century, U.S. stocks went through many secular bear markets. Keith points to the 1929-1932 period when the Dow Jones Industrial Average declined by nearly 90 percent, along with pointing out the Dow's loss of more than 52 percent from 1937 to 1942. Also, beginning in 1901, 1906, 1916 and 1973, there were four "40+ percent declines," says Keith. And, over the past 100 years, the Dow gained an outstanding 24,000 percent. So despite setbacks including inflation, Tiananmen Square protests, the Asian financial crisis of 1997, and the SARS scare, over the last 30 years, China's average annual real GDP has grown 10 percent. With rising incomes and increasing urbanization, we believe China is pursuing the American Dream, and the government has shown great determination to build the necessary infrastructure along with a robust urban labor market. On a purchasing power parity basis, China's share of world GDP has risen significantly, from around 3 percent in 1985 to a current world share of nearly 16 percent. Yet, China is only in the middle of its supercycle with several stages to come. Supercycles, or what we call S-curves, are long, continuous waves of boom and bust inherent in human history. While the overall trend is up, periods of volatility are an intrinsic part of this supergrowth. Not every down period is a sign of demise--even a broken clock is right twice a day. It's the wise active manager who learns to manage expectations by understanding the difference between short-term corrections and secular long-term bear markets. 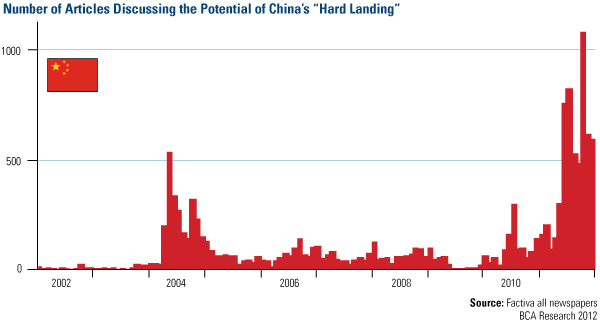 While "risks certainly cannot be taken lightly," BCA Research believes that the risk of a China crash is "exaggerated." For example, bears often point to "shadow" banking practices to support their case. Keith believes Beijing was "deliberately tapping on the brakes," in 2009, when the central bank increased the reserve required ratio for commercial banks, effectively reducing the amount of money banks could loan. This resulted in a sharp decrease in the amount of credit available and significantly increased rates from 4.78 percent to 8.06 percent, according to BCA. One negative consequence of China's quantitative tightening was that it forced some private firms unable to gain loans from state-controlled banks to seek credit from "loan sharks at sometimes deathly high borrowing costs," says BCA. We sent our research analyst to his home country of China to find out how prevalent this problem was. The Shanghai-native Xian Liang joined an investigative tour led by research firm China International Capital Corporation (CICC) to the Zhejiang Province. His group had access to executives from banks, private lenders and local government agencies, many of which he found knowledgeable and shrewd. During his research trip, he learned about an extensive survey done by Alibaba of 2,800 smaller and medium enterprises, which showed that half of the enterprises needed external financing, and the companies that currently borrow from banks--only 13 percent of Alibaba's sample--faced pretty stringent risk management practices. For example, one commercial bank that lends primarily to smaller companies checks the electric and water meters of the businesses to make sure they are actually using energy. They delve into the personal habits of the private entrepreneurs to gauge if the executives are creditworthy and financially sound, as it is believed that character has a lot to do with one's willingness and ability to repay. Overall, Xian understood the alleged systemic credit risks in the banking system to be manageable at this point. The government had been prudent to not only raise interest rates six times, but it also increased the reserve limit banks must set aside against loans. BCA identified an additional unintended consequence of the tightening. Some banks tried to bypass tight regulatory controls so they could extend credit, leading to an "increase in off-balance-sheet activities," according to BCA. This activity was recognized by the government, and the central bank has "increased its oversight of off-balance-sheet items." BCA says that in a way, "'shadow' banking activity can be viewed as an attempt by market participants to create more market-driven interest rates." 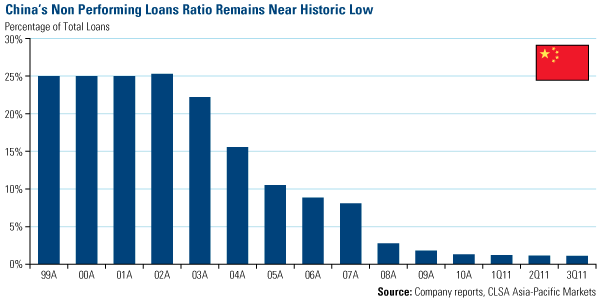 In a report of Asian banks, CLSA Asia-Pacific Markets found that non-performing loans (NPL)--those assets not yet delinquent but that have fallen behind schedule--remain near a 12-year low in China, and the NPL-to-loan ratio is under 1 percent. This default rate is extremely low compared to the 1999-2002 timeframe, and it is believed that no large debt defaults are expected due to China's ability to create liquidity. Keith Fitz-Gerald says the government has an abundance of liquidity. It has set aside $3.2 trillion in reserves, amounting to half of the country's entire GDP. Keith says this could potentially be spent on recapitalizing its banking sector, with "plenty of money to spare." 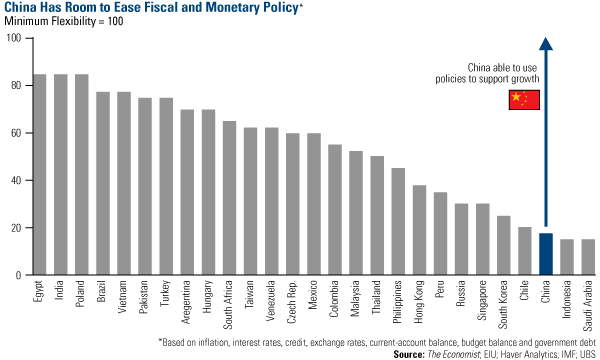 Besides the reserves, China has more fiscal and monetary firepower than several emerging markets. The Economist analyzed 27 emerging markets and ranked the country's ability to ease monetary policy, taking into consideration inflation, excess credit, real interest rates, currency movements and current-account balances. Then it created a "fiscal-flexibility index" which included government debt and the budget deficit. A score of 100 means a country has no flexibility to ease policies; a score near zero means a greater ability to "let out the throttle." This chart "suggests that China, Indonesia and Saudi Arabia have the greatest capacity to use monetary and fiscal policies to support growth," compared to other listed emerging markets, says The Economist. Many bearish articles that appeared last fall relied on generalities taken out of context. They offer anecdotes of ghost cities, empty shopping malls, robber barons, worker suicides and citizen protests as reasons the country as a whole is headed for a crash. These efforts to highlight China's economic imperfections are akin to saying the U.S. is a poor nation because impoverished areas still exist. As analysts, it is our job to research and make a rational determination whether the facts are material or superfluous. "China is merely going through the first uncomfortable growing pains of its adolescence," Keith says, and he does not believe it's the end of the world if China goes through a market correction. What he'll be doing instead is investing. As our team continuously weighs the evidence of China's economy, I agree with my friend. Moments such as these offer buying opportunities for global investors. We believe China is a buying opportunity.